The Horace Mann League presents its Outstanding Friend of Public Education Award to Jack Jennings, founder and CEO of the Washington-based Center for Education Policy, at its annual awards luncheon and officer installation on Friday in Houston. 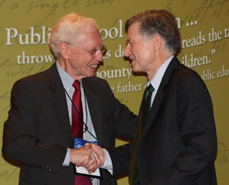 Jack Jennings (right) receives congratulations from Gary Marx after receiving the Horace Mann League’s Outstanding Friend to Public Education Award during the 2012 AASA national conference in Houston. The league, one of the oldest pro-public education advocacy organizations in the United States, uses its annual affair at the AASA national conference to install new officers and board members for the coming year. This year’s event marks the organization’s 90th anniversary. For its top honor, the league cited Jennings, who is retiring this year, for many efforts supportive of public schooling over the years. He is author of Ten Big Effects of NCLB on Public Education and edited four volumes on federal education policy. He writes a blog for the Huffington Post and has published 12 articles in Kappan. Spike Jorgensen received the Friend of the Horace Mann League Award. Jorgensen served as a board member from 1993 to 2003 and served as league president during 2003-2004. He also has served as the president and executive director of the Century Club 100, president of the Alaska Association of School Administrators and executive director of the Citizens for Educational Achievement for Alaska. He worked as superintendent in Tok, Alaska, and was a finalist for National Superintendent of the Year. Brent Clark, Mark Edwards, Joe Hairston, Eric King, Art Stellar, Gary Marx and Steve Rasmussen. The Horace Mann League also installed its new officers: president, Mark Edwards, superintendent, Mooresville Graded Schools, Mooresville, N.C.; president-elect, Joe Hairston, superintendent, Baltimore County Public Schools, Towson, Md. ; vice president, Gary Marx, president, Center for Public Outreach, Vienna, Va.; 1st vice president, Julie Underwood, dean, School of Education, University of Wisconsin, Madison, Wis.; 2nd vice president, George Garcia, former superintendent, Boulder Valley Public Schools, Boulder, Colo.
William Hite, superintendent, Prince George’s County Public Schools, Upper Marlboro, Md. Eric King, former superintendent, Muncie Public Schools, Muncie, Ind. Evelyn Holman, former superintendent, Bay Schools Unified School District, Bay Shore, N.Y.